It’s pretty easy to analyze the Phillies’ side of this trade. At least as far as the 2019 roster is concerned, Realmuto just replaces Alfaro behind the plate. After 2019, Realmuto will have one more year of team control, and it’s probable that, before too long, the Phillies and Realmuto will engage in talks about a contract extension. I don’t know if they’ll *agree to* a contract extension, but the odds of Realmuto getting locked up are far greater than they were in Miami. Realmuto ought to be a fairly predictable player. It’s always dangerous to suggest something like that, because almost literally anything could happen, but over the past few seasons, Realmuto has blossomed into quite possibly, or probably, the best catcher in baseball. Think about that. Or, if you prefer, read about that, in the article I just posted earlier today. That’s where you’re going to find more of my Realmuto analysis. All I’ll include here is a summary. 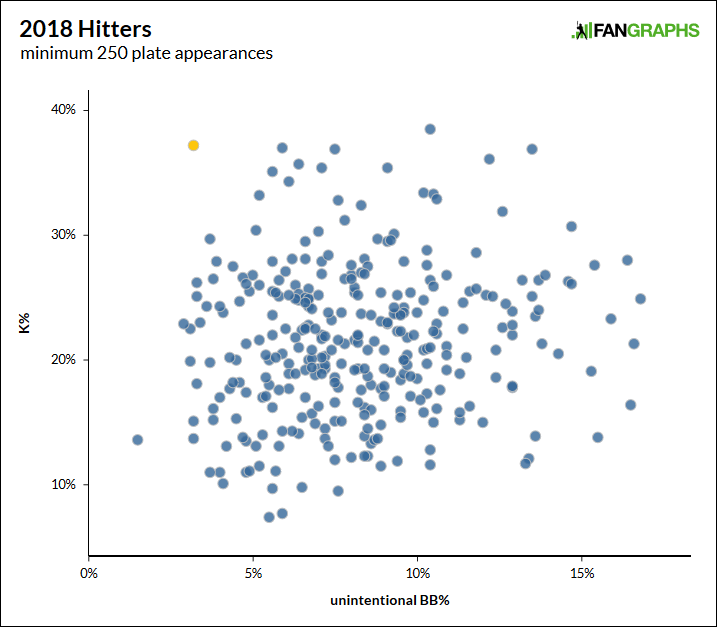 By the numbers, Realmuto is a perfectly fine, and potentially above-average defensive catcher. More importantly, he’s very rarely missed a game, and he seems like the most athletic backstop in either league. He’s clocked in as the fastest. And while his park-adjusted offensive numbers have been solid, there’s also ample reason to believe Realmuto just couldn’t perform at his best in Marlins Park. Almost no one has ever posted such a dramatic reverse home-road split. I can’t explain exactly what happened to Realmuto in that environment, but there’s a legitimate chance he becomes all the more dangerous in Citizens Bank. Miami just killed him up the middle, and to the opposite field. Realmuto has the skills to be an all-fields threat. This is arguably an acquisition on the level of getting Harper or Machado. It also doesn’t preclude an acquisition of Harper or Machado. If the Phillies can pull that off, it would be reminiscent of the Brewers getting Christian Yelich and Lorenzo Cain at almost the exact same time. Never mind what the Phillies have already done, even before today. This is an enormous boost to their odds of contention, and it’ll apply pressure to the Braves, Nationals, and Mets. This is a division that the up-and-coming Braves just won. They might seriously now end up in fourth place. It’s the return for Realmuto that’s particularly intriguing. Realmuto was always going to require a blockbuster package. And it was always going to look something like this. For however long the Marlins were thinking they might get someone like Brandon Nimmo or Ozzie Albies or Cody Bellinger, they were wasting everyone’s time. No one was ever going to get to that level. The Marlins were going to end up dreaming on prospects and unproven talent. This specific trade package comes with almost the widest error bars imaginable. What you think about this trade will be determined by your own level of personal comfort with risk. That’s Alfaro in yellow. He had one of baseball’s very highest strikeout rates, and he had one of baseball’s very lowest unintentional walk rates. This is…not a new concern, and the numbers might look even worse had Alfaro not spent so much time batting eighth. I examined baseball history for all players with at least 500 plate appearances between the ages of 23 and 25. I understand that eras have changed, and league averages have changed, but, regardless, Alfaro has easily the highest K-uBB% out of anyone. He’s a little like Mike Zunino if Mike Zunino had something in his eye. Alfaro swings and misses all the time. Alfaro swings and chases all the time. It’s a tough approach to believe in, even in this era of the breakout Javier Baez. You can’t just write Alfaro off, and he does have a big-league 98 wRC+. His batted-ball quality is outstanding. What’s evident is that, with a more mature approach, Alfaro could blossom into a legitimate star. He’s good at enough other things across the board. But at the same time, maybe the most probable outcome is that Alfaro’s career looks a lot like Miguel Olivo’s. Olivo played for a while, yet he never quite figured it out. While the Marlins are happy to have Alfaro, the real centerpiece here is Sanchez. Sanchez is the guy Phillies fans didn’t want to give up. Sanchez is the blue-chip prospect the Marlins were seeking. Our Marlins prospect list is updated, and Sanchez slots in at No. 1, easily ahead of Isan Diaz. He’s as talented as any pitcher in the minor leagues, and he’s only 20 years old. Even though Sanchez stands just 6’0, he pumps his fastball into the upper 90s. He already has a complete repertoire, and what’s most impressive is that Sanchez is a dependable strike-thrower. That’s not normal for power pitchers so young, and it’s especially abnormal for converted infielders. If you glance at Sanchez’s line for 2018, you’ll see a 2.51 ERA. The problem is that you’ll also see 46.2 innings. Sanchez was hurt. And he dealt with discomfort for the second year in a row. The big issue this year was elbow inflammation. Now, the inflammation calmed down, and Sanchez was eventually able to pitch. He’s also passed a physical, so the Marlins didn’t see reason to believe Sanchez is a ticking time bomb. But any arm injury is at least a yellow flag, and I’m told Sanchez was quietly available for much of the offseason. That would be another yellow flag, if not a red one. Teams generally make a point of keeping their top prospects. It should raise eyebrows when one of them is moved. There’s no questioning what Sanchez can do with a baseball. There is questioning how often he’ll be able to do it, and in what role. The minor-league numbers are good, but they’re not amazing. Alfaro is a huge risk as a hitter. Sanchez is a huge risk as a pitcher. Stewart, at least, is more comfortable, even though he’s also a young pitcher in the lower minors. He’s a 21-year-old southpaw who makes it terrifically difficult to get the ball off the ground, and the big change between 2017 and 2018 is that Stewart cut his walk rate in half. To this point it would be fair to say he’s flown under the radar, as a safer bet to eventually round out a big-league rotation. That could still be years away, but the sinker is a weapon. Stewart might have a real future. And the international money isn’t worth nothing. The Marlins will turn that into at least one prospect. On talent, then, the Marlins are satisfied. They basically have to be satisfied — this is the return they agreed to. They were always going to get a return that looked something like this. This level of volatility, however, means the boom-or-bust potential is almost off the charts. The Phillies don’t really know the future of what they gave up. The Marlins don’t really know the future of what they’ve acquired. The one sure thing is that the Phillies have obtained from the Marlins probably baseball’s best catcher. Whether the Marlins ultimately come away happy is anyone’s guess. Alfaro is going to be a test of their player development. Sanchez is going to be a test of their luck. Maybe the Marlins deserve some good luck. Maybe they’re actually the last team that would. We hoped you liked reading Phillies Acquire Great Catcher in Exchange for Mystery Box by Jeff Sullivan! Is there a boat in the mystery box? My mind immediately wanted to make a joke about the Marlins hoping there wasn’t a boat included in the deal for a top-flight pitcher, but then I thought…TOO SOON. So I settled for describing the joke, while acknowledging it’s in poor taste. I’m probably not a good person. If you can’t find the man in the boat, it becomes a mystery box.